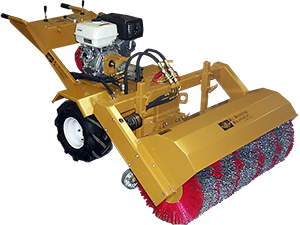 The 40" Hydraulic Sweeper Attachment is a powerful low maintenance sweeper for the high production roofer. The brush is driven by a powerful hydraulic motor with enclosed chain system. The double swivel caster support wheels allow the operator to sweep lightly or heavily as the situation demands.